Have you considered a Honeymoon in Ireland? Are you looking for honeymoon destination ideas? Now that the dress is paid for, the cake is ordered, the flower arrangements are chosen…. yeah you get the picture. You might be at the stage where it’s time to pick your honeymoon destination! Why not choose a honeymoon in Ireland? The great thing about an Irish honeymoon is that literally every need and request can be catered for. From a traditional romantic honeymoon to an adventurous honeymoon for the thrill seekers. Can you imagine yourself in a luxury castle or calling a traditional Irish cottage in the countryside? On the other hand can you see yourself spending the time exploring the beautiful Irish countryside and the many wonders Ireland has to offer? Ireland vacations have always been very popular due to their versatility. 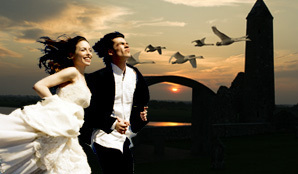 We hope if you choose Ireland as your honeymoon destination that you will enjoyed your stay here. As our slogan reminds you: “A honeymoon in Ireland is a trip that will never be forgotten.” Call us today if you require any information. This entry was posted in Honeymoon in Ireland and tagged honeymoon in Ireland, Honeymoon Ireland, Ireland Honeymoon, Ireland vacations. Bookmark the permalink.